Feb. 4, 2015 1:00 p.m.
A similar question is the basis of a Spelling Bee, a competition involving young students asked to spell words of varying difficulty and a panel of judges called ‘pronouncers’. There are prizes such as cash, certificates and oftentimes both and there definitely is glory. This popular event, nerve-wracking for the students and their families, takes place in thousands of North-American and global schools every year. The first Spelling Bee on record was in 1925, in Washington DC. However an earlier name, the Spelling Match, has been traced back to 1808. In 2006, Canada and New-Zealand entered the US National Spelling Bee for the first time. Aimed at grades four to eight, Spelling Bees represent what parents and teachers alike hope to accomplish with their youths as they advance through elementary grades towards junior high and beyond, to prepare them to master the English language and in order to express their ideas, opinions and concerns in a sensible and clear language. Not all students are willing to participate. For those who do, the participation can lead to greater self-confidence and a competitive spirit that will tackle other challenges. The popularity of today’s technology, including electronic communications, has created an enormous challenge for teachers. Teaching subjects such as spelling, writing and science can seem to be a futile endeavor when technology offers complex and infinite data and does not expect people to write words in their entirety. But the challenge lives on in our society. Elementary school teachers still teach the art of language to eager young minds. Curriculums address the powers of independent thinking in pre-adults and professional degree preparation still requires the creation of essays, thesis and oral presentations. Eleven schools in our region have been preparing for the February 18 Black Gold School Division (BGSD) Spelling Bee. 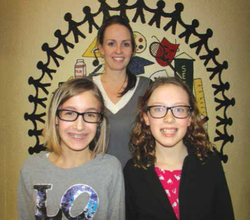 Recently, Caledonia School in the City of Leduc held its own spelling Bee, coordinated by Mrs. Cassie Peters, Grade 6 teacher at Caledonia School, who is also the organizer of the District event. Caledonia School’s Spelling Bee is handled a bit differently than others in the division. The Parent Council treats it as a fundraiser as participating students get sponsored, which helps out with the cost of prizes and certificates. Two winners of each grade then competed in a second spelling round. Two winners for each school will now advance to the regional event, facing keen spellers against others from around Leduc County. As funds for school events and outings are limited, the Black Gold Spelling Bee Committee is grateful to sponsors who have come forward to support the monetary prizes, certificates and t-shirts for the participants. Kudos go to Budget Drywall, The One Radio -93.1FM, Stichin’ Magician (Wetaskiwin) and another enthusiastic spelling bee supporter. Held in the Caledonia School gymnasium at 7pm, the Regional Spelling Bee Judges Panel will include BGSD Associate Superintendent Calvin Monty and two hosts of The One Radio. Congratulations go to the winners of the individual Caledonia Grades, to all the District contestants, and most of all, to Kaylyn Fraser (Grade 5) and Charlie Heinz (Grade 4) who will proudly represent Caledonia School at the District Spelling Bee on Wednesday, February 18. Spectators are more than welcome. Pictured: Kaylyn Fraser (Gr.5) and Charlie Heinz (Gr.4) will proudly represent Caledonia School at the District Spelling Bee. Photo submitted.